In 2015, KVB introduced a new level of sheeting quality. The “Synchro-Fly Sheeting System” was put in serviced to deliver a new benchmark. Synchro-Fly Sheeting System, also known as "Twin knife" uses?dual blades. These blades rotate in synchronization to precisely meet in the middle for accurate sheeting in high speed. Whereas the conventional "Death Knife" system has only one rotating blade (the bottom blade is fixed). 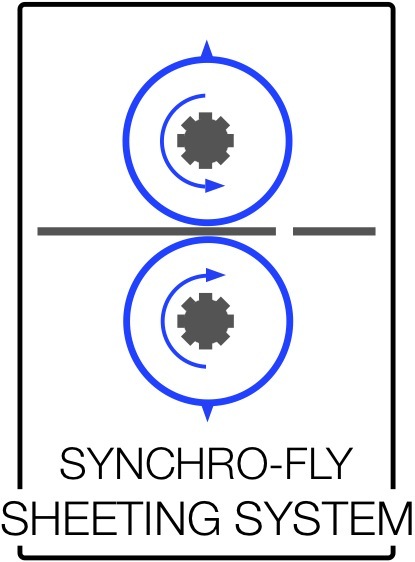 The Synchro-Fly system provides better sheet's squareness and length accuracy when they were sheeting at high-speed. Two downsides of the "Death Knife" system are the shape of the cutting edge and the squareness of the sheeted paperboard. Synchro-Fly Sheeting System is able to deliver squared cutting edge and better?squareness of the sheets. Delivered and print, as simple as that. Another feature of the Synchro-Fly Sheeting System is the dust free operation. No loose fibers acquired from the cutting action. At KVB, we also installed additional dust collection vacuum system on both sides of the paperboard to ensure extra guarantee of no “Hicky” printing problem.